New 2004 European Model Mid-class Commuter, Yamaha "Majesty 400" debuts at Milano Show Mounting a newly developed DOHC 4-valve single-cylinder 400cc fuel injection engine - News Releases | Yamaha Motor Co., Ltd.
At the 60th Milano Show (bicycles and motorcycles) opening on September 16, 2003, Yamaha Motor Co., Ltd. (YMC) displayed the new 2004 European market model Yamaha Majesty 400, a next-generation sports sedan mounting a newly designed liquid-cooled 4-stroke, DOHC, 4-valve, single-cylinder 400cc engine with fuel injection and a CVT transmission. The 250cc sports sedan Majesty that was first released in Europe as a 1996 model quickly won strong popularity for its great styling, sporty ride and outstanding comfort and utility and became a best-seller in the market. After that, in September of 1999 the Majesty would be re-introduced in its second-generation renewal with boosted engine performance and a re-designed body. When it went on sale the next year it once again won a strong following from a wide ranger of users. In the European market there has been a steady demand in the range of 240,000 units annually for scooters in the over 125cc class. Especially in Italy, where scooter demand is particularly strong, the Majesty (250cc) has continued to be very popular ever since the introduction of the first model. The reasons for its popularity include (1) reliability, (2) storage space, (3) quality, (4) comfort, (5) ease of use in around-town riding and (6) its impressive styling. And, the user demographic covers a wide range with a median of about 40 years old. For these reasons, the Yamaha Majesty has maintained its popularity even as the other makers have entered this category with rival models. But, lately, a new trend has emerged, as demonstrated by the popularity of models with larger wheel radius and engines of over 250cc, and there has been a strong call for models that answer the needs of use on cobblestone streets or high-speed expressway riding. 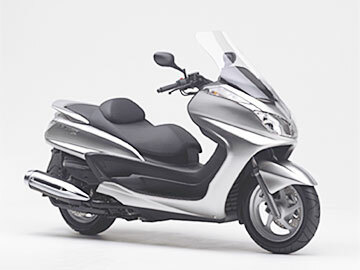 It was in response to this trend that Yamaha chose a whole new level of performance as the theme for its next-generation Majesty and developed a model with the kind of performance and handling stability to accommodate both around-town and high-speed riding with no sense of stress, while also providing a high-level balance of comfort and convenience. In specific terms, Yamaha designed the new Majesty to be a model that opens up a whole new world of riding enjoyment with the potential for (1) performance to enable cruising at 150 km/h, (2) a high level of performance on cobblestone or other types of difficult road surfaces, (3) styling befitting a next-generation sports sedan and (4) the kind of comfort and storage capacity that makes for enjoyable long-distance riding. To realize this new model concept, a new 400cc DOHC single-cylinder fuel injection engine with CVT transmission was developed for the new Majesty. Added to this are a 14-inch front and 13-inch rear wheel, optimized dimensions and a new frame featuring parts made with Yamahas CF aluminum die casting technology in a package that achieves a high-level balance of performance beyond anything yet in its class, innovative styling and utility that any rider will appreciate. In a word, this is the fastest mid-class commuter that further develops the outstanding ease of use of the existing Majesty while adding a power-weight ratio equivalent to the TMAX in a compact body. A completely new liquid-cooled 4-stroke, DOHC, 4-valve, single-cylinder 400cc engine with a CVT transmission was adopted. A 4-valve layout and pent roof type combustion chamber designed to accommodate the fuel injection system in the ideal way, plus an 83 x 73mm bore x stroke and a 10.6: 1 compression ratio give this engine a maximum power output of 25.5kW (34.7PS)7,500 rpm and a maximum torque of 3.7 kgf-m/6,000 rpm. For the piston, a forged aluminum type with its excellent heat tolerance and compact design potential is adopted. With its reduced reciprocating mass, it helps achieve smoother power development characteristics. To ensure excellent reliability, a bushing type metal housing is adopted for the crankshaft journal (the existing model uses a ball bearing). This gives a smooth power development feeling especially during acceleration, while also reducing the acceleration noise level for added comfort. To achieve the right combination of intake efficiency and response, this model adopts the same kind of suction piston type fuel injection system that has won a strong reputation on the YZF-R1 and R6. Employing a free piston that operates in response to pressure fluctuations, this system is characterized by its ability to control air intake to achieve optimum volumes from the lowest speeds on up. This provides response that has the smoothness of a natural air intake plus the type of linear response that only fuel injection can give. This system also ensures excellent fuel economy and reliability. This FI is characterized also by the optimized, compact design of the sensing components and fuel supply system. Unlike a conventional FI system for a 4-cylinder motorcycle engine that depends of information from a large number of sensors, like a crank-angle sensor and air pressure sensor, the FI on the new Majesty has been designed around the fact that the changes in pressure in the intake manifold (kinetic fluctuations) are inherently related to factors like air pressure and the degree of throttle opening. Based on this, a system has been devised that uses a single sensor to monitor a number of parameters. This simplified design employs just five sensors. The fuel supply system makes use of a newly designed compact fuel pump, while the regulator and filter parts have been designed into a single module that reduces the number of parts and enabling a more compact design. For the injector, a 12-outlet, 2-directional type has been adopted to achieve optimum fuel injection. Furthermore, the adoption of a return-less type fuel supply layout has also helped enable a simpler, lighter system. Also, to provide an ideal match for the FI system, a two-piece air cleaner with separate left and right sections is adopted for the first time on a Yamaha single-cylinder models and provides a combined cleaner volume of 8.5 liters. This ensures good low- to mid-speed performance and excellent response characteristics. In order to achieve a smooth, quality running feeling and great reliability, a V-belt incorporating the next-generation super-fiber Zylon (*) with outstanding shock absorption, high tensile strength and overall toughness is adopted. (* Zylon is a trademark of Toyobo Co., Ltd.) For the V-belt case that is an important factor in achieving good acceleration performance and running performance characteristics, a latest-design case is adopted that achieves both highly efficient introduction of outside cooling air and a high degree of water proofing. To provide the added electricity needed to power the FI system and the new H4 twin-lamp headlight, a ferrite type high-efficiency compact magneto has been adopted. The combination of new magnetic circuitry and optimized dimensions, shapes and materials for the various components has made possible a reduction in generation loss and increased output. Despite being the same size as the existing unit, output has been increased by 20 to 30 percent. Other engine-related features include (1) a radiator positioned under the foot space to make effective use of the cooling effect of the running air flow, (2) an engine oil capacity of 1800cc for minimized oil deterioration (vs. 1400cc on the existing Majesty), (3) a side drain bolt for easier maintenance, (4) automatic decompression for great starting performance and (5) an air induction system and catalytic converter for outstanding environment friendliness to clear EU2 emissions standards. For the frame with its important role in determining the machines running performance and handling stability, a newly designed frame is adopted that features a two-piece upper frame divided into forward and rear sections. The forward section of the upper frame is made of hollow aluminum stock cast in a metal mold for optimum rigidity, while the section from the center aft is made with Yamahas exclusive CF (controlled filling) die casting technology (using a high-strength, highly corrosion-resistant aluminum alloy specially developed for the YZF-R6). The two sections of this frame are then welded together. The under section of the frame uses steel members to complete a design that uses a variety of different metal alloys selectively to achieve the ideal rigidity and strength qualities demanded in each of the different sections of the frame. The result is a frame with 86% better torsional (lateral) rigidity and 54% improved longitudinal rigidity to achieve excellent rigidity balance that contributes to running stability. Another defining characteristic of this frame is its wide framework that also enables a design with abundant storage capacity. A unit-swing engine mount system that makes highly efficient use of space is adopted. Also, linked type mounts are used. In combination with the engines built-in single-axis balancer, this reduces vibration. The front fork has 41mm diameter inner tubes that combine with the 35mm diameter steering pipe to achieve an excellent rigidity balance. The cushion stroke has been increased by 20% compared to the existing model to 120mm. Also, the under bracket adopts a tapered roller bearing that reduces resistance for a smoother steering feeling. Meanwhile, the rear suspension adopts a large 12.5mm diameter rod and a wheel travel that is 20% longer than the existing model at 104mm to ensure a more comfortable ride. To achieve a great balance of high-speed cruising performance and ease of use in around-town riding, the front tire size has been changed from the former 110/90-12 to a 120/80-14 and the rear tire from a 130/70-12 to a 150/70-13. At the same time, new-design wheels have been adopted with thinned out sections on the inside of the rims to reduced weight while maintaining an optimum strength balance. The design of these new wheels accents the increased size. And, despite the increased diameter of the 13-inch rear wheel, optimum use of space has enabled a design that accommodates plenty of storage space. The new styling of the Long & Low body with its horizontal orientation is designed to accentuate the sense of a new dimension of running performance and comfort. The front mask adopts the image of an inverted triangle within which the eyes show that this is indeed a Majesty. The actual design elements include (1) the design of the headlight assembly with its high-visibility, high-illumination spec lamps (60W/55W  H4 bulbs), (2) touches that make the front mask appear smaller overall while still giving the necessary wind protection and (3) a front fender design that accentuates the directed flow of air to the radiator. The tail assembly design adds a distinctive look to the rear view of the new Majesty with its balance of (1) a design that gives the impression of a smooth flow of air from the front of the machine through the tail area and (2) the shaping of the rear fender to reflect the curve of the tire. Also the adoption of an LED tail lamp increases design freedom to add another distinctive accent to the new Majestys rear view. Furthermore, the cowling and screen have been designed using the latest flow-dynamics analysis technology to achieve outstanding balance of rider wind protection and air management performance. By providing a gap between the cowling and the windscreen that enables precise management of the air flow when running, buffeting of the rider and tandem passenger by swirl-back wind is minimized, as is wind noise, to ensure outstanding riding comfort. He adoption of the new frame has allowed the room for plenty of storage compartment space. Under the seat is a compartment with a capacity equivalent to 59 liters (enough for two full-face helmets or a full-face helmet and a A3 size briefcase). Meanwhile, the front inner boxes have capacities of 1.9 liters on the right and 8.6 liters on the left. This brings the total storage capacity to 69 liters, or 3 liters more than the existing Majesty. The other features offered on the new Majesty include (1) a key entry type immobilizer anti-theft device, (2) multi-function meters including a tachometer (liquid crystal display with coolant temperature and air temperature options), (3) a 14-liter fuel tank designed to provide a running distance of 300 km per filling, (4) a nylon plastic grabbar, (5) a foot hold that provides an excellent foot platform for the tandem rider and (6) a new seat with excellent mounting/dismounting ease and easy leg reach to the ground.